Dr. Michele Thomas is a board certified Obstetrician/Gynecologist serving the metropolitan Detroit and surrounding area. She began her private practice in 2005 after being employed for 6 years. Dr. Thomas obtained here undergraduate degree from the University of Michigan with a B.S in Biology/Psychology. She attended the Medical College of Ohio for medical school and completed her residency training at Wayne State University/Hutzel Hospital. While at Hutzel Hospital, she was elected executive chief resident during her final year. 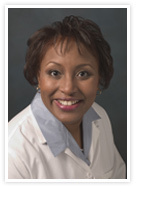 Dr. Thomas has received numerous awards for her commitment to teaching residents. She received the Joan Stryker, M.D. award for “Excellence in Teaching” for 2 consecutive years and the Henry Ford Faculty Staff Teaching Award. Dr. Thomas has hospital privileges at Providence Hospital and at the Detroit Medical Center’s (DMC) Hutzel/Harper hospital. She is a fellow of the American College of Obstetricians and Gynecologists, National Medical Association & the Michigan State Medical Society. She is also a member of Delta Sigma Theta, Inc. She is married and has two children. Outside interests include her work with her health care ministries at her church and in the community, traveling, gardening and spending precious time with her friends and family. 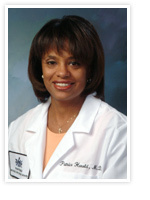 Dr. Patrice Harold was born and raised in Detroit, Michigan. She received her Bachelor of Arts degree in Chemistry from Wayne State University. She obtained her medical degree from Wayne State University School of Medicine in 1989. She did her residency in Obstetrics and Gynecology at Hutzel Womens Hospital in Detroit Medical Center. After completing her residency she was emplyed by the Detroit Medical Center to practice and oversee The Institute for Womens Medicine in Southfield, MI. In March of 2000, she started her private practive in Southfield specializing in women's health. She currently is the Director of Minimally Invasive Surgery at Hutzel Hospital. Dr. Harold's professional affiliations include the National Medical Society, the Detroit Medical Society, and the Michigan State Medical Society. She is also a Fellow of the American College of Obstetrics and Gynecology. Dr. Harold is also a member of Alpha Kappa Alpha Sorority Inc., Motor City Chapter of Jack and Jill and a member of Sacred Heart Catholic Church in Detroit, MI.